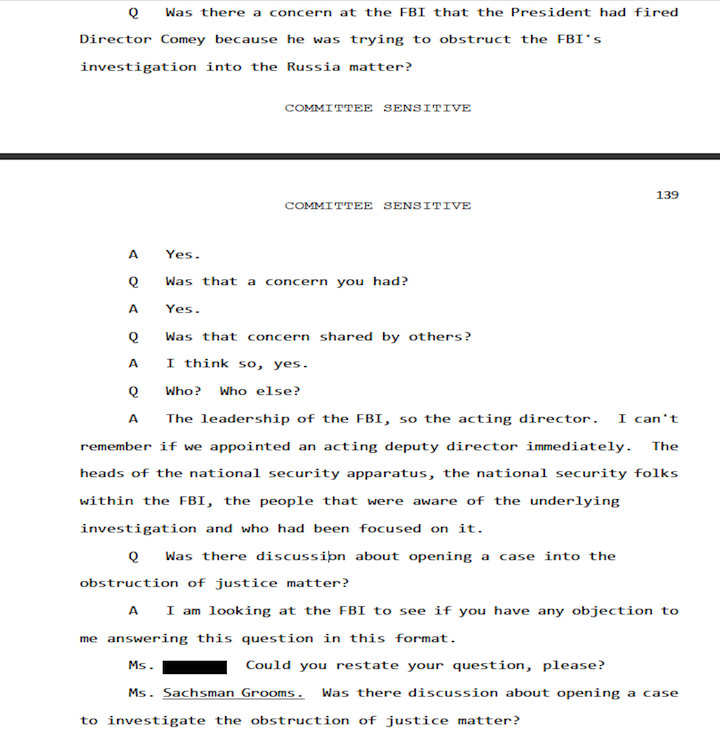 Thread by @seanmdav: "Former FBI general counsel and Comey confidant James Baker testified to Congress in late 2018 that his predecessor, Mueller deputy Andrew We […]"
When FBI general counsel James Baker was asked to detail his conversations about the Steele dossier w/ his "long-time friend" @DavidCornDC, Baker's attorney said Baker couldn't discuss the matter because he was being investigated by federal prosecutors for criminal leaking. Baker then proceeded to discuss his interactions w/ Corn regarding the dossier. According to Baker, Corn--who claims to be a journalist--was very "anxious" to provide the debunked Steele dossier to the FBI. Baker provided a 302 of his conversations with Corn, a la Ohr/Steele. Baker specifically testified that he treated the Steele dossier he received from @DavidCornDC as "evidence." Baker also said he did the same thing with dossier information he received from attorney Michael Sussman of Perkins Coie, which hired Fusion GPS on Hillary's behalf. As far as we know at the moment, the FBI received the same anti-Trump/Steele dossier "research" from at least five different compromised partisan sources: Steele, Bruce Ohr, Nellie Ohr, David Corn, and Michael Sussman, plus the State Dept. sources (Shearer, Blumenthal, etc.). Baker testified that prior to entering Clinton/DNC opposition research from the Clinton/DNC attorney into FBI evidence, he never asked or disclosed the source (or his motivation) of the so-called evidence. You have to wonder how much of this stovepiped nonsense was used in FISAs. After testifying that he was aware of Peter Strzok's texts, Baker claimed that he wasn't aware of any efforts by FBI staff to "stop" Trump's election. Peter Strzok texted his mistress Lisa Page that "We'll stop it" when she asked if Trump would become president. James Baker, the top lawyer at the FBI who provides final sign-off on FISA applications before the FBI director okays them, testified that he never even bothered to read the underlying evidence for the Page FISA (the so-called Woods file) before affirming its veracity. Baker also testified it was common knowledge that there was a high-level conversation about Rod Rosenstein wearing a wire against the president of the United States. Roseinstein has refused to testify before Congress since that wire conversation was revealed. Baker, the top FBI lawyer, testified that it was Rosenstein's idea to wear a wire against the president, and that Baker suspected Roseinstein wanted to get revenge against Trump for using Rosenstein's anti-Trump letter as a pretext to fire Comey. 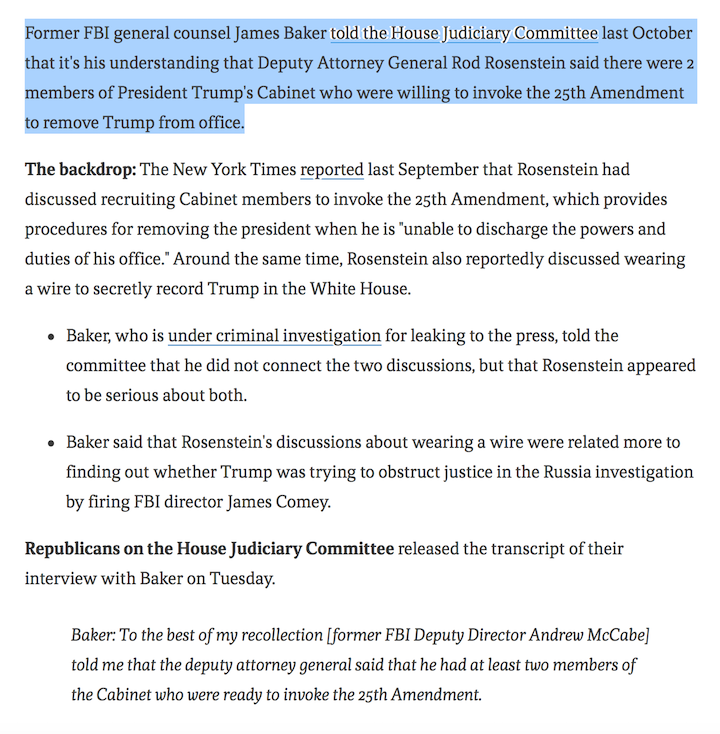 According to Baker, Rosenstein also floated the idea of using the 25th Amendment to remove Trump from office, in addition to wearing a wire against him. Baker claimed Rosenstein had identified two cabinet members who wanted to help him take down the president. When Baker was asked who told the New York Times that Rod Rosenstein had contemplated wearing a wire against the president and using the 25th Amendment to remove him from office, Baker's lawyer refused to let him answer the question. It is unconscionable, given his role in firing Comey, trying to take out the president, and CYA hiring Mueller, that Roseinstein still has a job. Totally not spying you guys. When Bush did it, not only was it spying, it was the kind of spying that needed to be banned. Back in 2014, per the New York Times, spying was defined as being "subjected to surveillance by the federal government." Oh how the Times have changed! Baker testified that he does not actually know whether Deputy AG Rod Rosenstein eventually wore a wire as part of a scheme to remove the president of the United States from office. "I have not confirmed one way or the other whether it took place." Incredible exchange here. 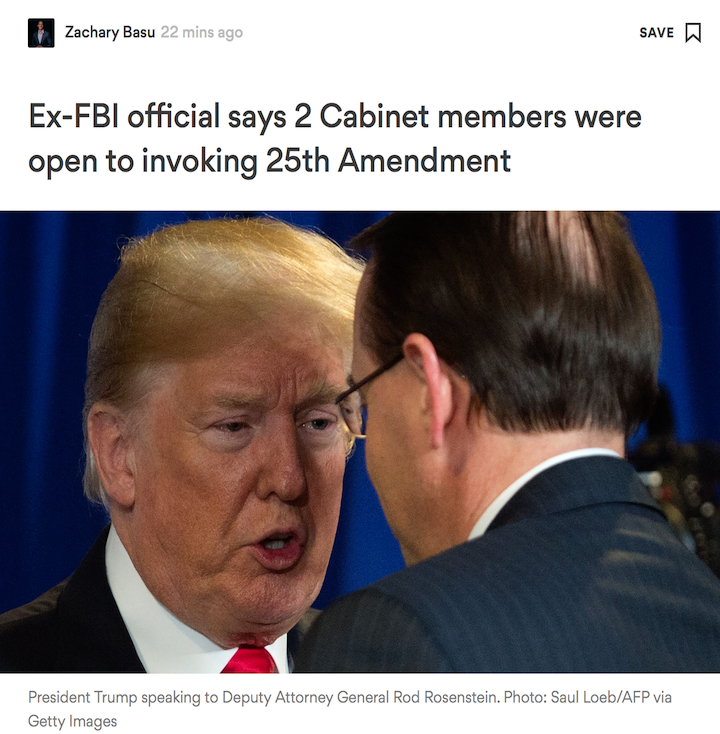 According to Baker, Rosenstein and two cabinet members were "onboard with this concept" of using the 25th Amendment as part of a coup to remove the president from office. Baker said he did not know who the two cabinet members were. Fun @marchmadness basketball statistic: so far in the NCAA tournament, UVA (111.86 O, 99.32 D) has put up significantly worse defensive efficiency numbers (pts. allowed per 100 poss.) than Texas Tech (106.08 O, 84.80 D), and has done so against far weaker opponents. Against teams ranked #163, #32, #28, #9, and #11 per @kenpomeroy, UVA has put up an efficiency margin (pts. scored per 100 poss. minus pts. allowed per 100 poss.) of just 12.54. Against teams ranked #96, #22, #6, #2, and #3, Texas Tech has an efficiency margin of 21.28. Both @UVABasketball (Duke, Florida St.) and @TexasTechMBB (Kansas, West Virginia) have only lost twice since February 1, and both games featured catastrophic defensive breakdowns. Their only common opponent this season was Duke, which beat them both, but in very different ways. BAKER: This was not a joking sort of time. This was pretty dark. Q: Was there a concern at the FBI that [TRUMP] had fired Director Comey because he was trying to obstruct the FBI's investigation into the Russia matter? Former FBI general counsel JIM BAKER: Yes. Q: Who else was concerned that TRUMP fired Comey to obstruct the FBI's investigation? May we have Faith like Daniel in the Lion’s Den!! Hebrews 11:1 Faith is the substance of things hoped for, the evidence of things not seen! I add Q drops that match the deltas (time between tweets) and timestamps on President Trump’s Tweets as a way to re_read drops and to see if they are deliberate on POTUS part, possibly pointing to a specific drop. Sometimes they seem to be! Former FBI general counsel and loser leaker James Baker met during the 2016 season with at least one attorney from Perkins Coie, the Democratic National Committee's private law firm. Baker was interviewed by lawmakers behind closed doors yesterday. Baker's interview broke new ground both about the FBI's use of news media in 2016 and 2017 to further the Trump case and about Rosenstein's conversations in spring 2017 re: use of a body wire to record Trump.